Mystic allows you to have a tan while you get tan! The Mystic is great for those who need to get a quick tan or just even out their tan for a special event, such as a reunion, wedding, etc. Check any and all products that you use on your skin to make sure they do not contain Mineral Oil or Petroleum/Petrolatum. You should stop using any products that contain these ingredients for several days before your Mystic Tan session. These ingredients leave a coating on your skin and you need to be sure�that there is no residue left behind. Mineral oil and/or Petroleum products can cause the Mystic Tan to turn greenish, streaky, or block it out altogether. Shower/Shave/Exfoliate before your session so that you are starting with a fresh, clean canvas and because the longer you can put off shaving and exfoliating after your spray, the longer the color will last. Moisturize immediately before getting into the Mystic booth. It must be a water-based lotion (meaning that the first ingredient is water) that does NOT contain Mineral Oil or Petroleum/Petrolatum. We recommend using products that we carry from the Mystic Tan company because they are specifically designed for the Mystic, and will not contain ingredients that interfere with the spray tan giving you the best possible result that will last longer. Apply lip balm before getting into the booth. Most people just close their eyes, but we do have disposable eyewear available for purchase. After exiting the Mystic booth, you will need to completely towel off all excess mist (in a circular motion) before redressing. We provide a clean bath towel to dry off after your session. You cannot get wet for at least 4-6 hours after your session while your tan is developing. No swimming, bathing, working out, or moisturizing. Many people find it best to Mystic Tan in the afternoon or evening and then put off showering until the next day. Watch the instructional video before your first session. You can watch the video at the salon, however, you can watch the video online before coming to speed up your visit. 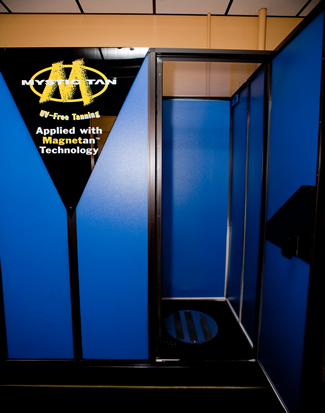 We do not take appointments due to varying times that people require to use the Mystic booth. Just stop in at your own convenience, however, we strongly recommend you have at least 30 minutes to set aside as you do not want to rush this process!